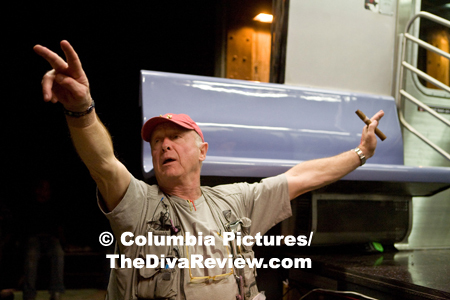 Director Tony Scott's name has long been synonymous with action films. His CV lists some of the highs and lows in the genre, Top Gun, Days of Thunder, The Last Boy Scout, True Romance, The Fan, Domino, etc. His hyperactive cinematography and lightning-quick editing style are his signature. What an odd fit British bombast-meister Scott seems to remake the low-key classic thriller, The Taking of Pelham 123. While Scott, et al, quickly decry this film being a remake (- A “retooling” how the director described it to me. ), let’s face it, for anyone who’s seen the 1974 original, comparisons are inevitable. The low-down: In the middle of the bustling Big Apple, the unthinkable occurs; a subway train is hijacked and its passengers held for ransom by a group of well-organised thugs led by one Mr. Ryder. Enter working schmoe, Walter Garber, doing his job dispatching trains and keeping the system running as smoothly as possible from the Metropolitan Transportation Authority’s headquarters. Garber notices the unusual activity with the stopped locomotive (- the eponymous Pelham 123) but isn’t prepared to be contacted by the psychopathic Ryder, for whom mind games with the dispatcher are part of the cost of keeping passengers alive - that and ten million dollars. Despite the attempts at dissuasion by a hostage negotiator, Ryder displays his seriousness early on with tragic results and transit and government officials hurry to comply with his demands, but not before he drags Garber further into his psychotic web. As Garber and Ryder’s tense tête-à-têtes reveal more about each other’s identities and a few dangerous secrets, Garber becomes determined to put an end to Ryder’s standoff and free the hostages. 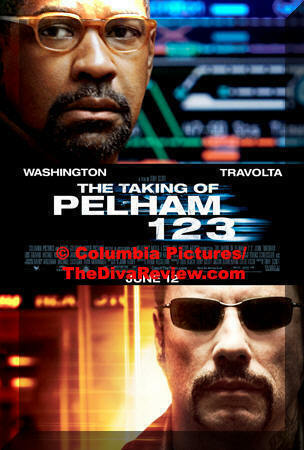 As Tony Scott films go, The Taking of Pelham 123 is relatively low-key. Concentrating most of the action down in one car in a subway tunnel, or in the glass encased MTA control center, Scott depends on his stars for most of the fireworks. Well done then to have Denzel Washington and John Travolta as your main artillery. As Garber, Washington gives his usual pitch-perfect rendering of this average Joe; an otherwise honorable family man who makes one gigantic mistake for which he’s paying with his dignity and soon with his very career. The sense of responsibility and guilt in Garber comes through beautifully and Washington elevates this working stiff into something noble, and because it’s a Tony Scott film, incredibly badass. Good as Washington is, the show belongs to Travolta, who is absolutely electric as Ryder, a vengeful nutjob whose appetite for money put him in prison and now in the cab of this subway car. 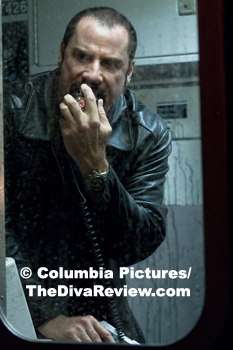 More energetic than we’ve seen him since Face/Off, Travolta bring that same sort of freewheeling mania, the just peeking-over-the-top craziness that makes his character more interesting than written. 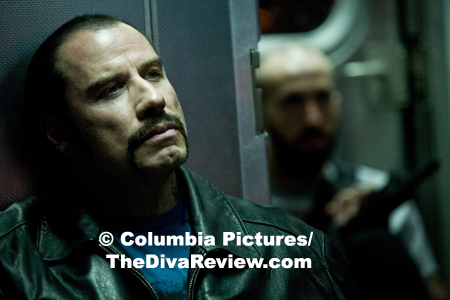 Eschewing vanity for the role, Travolta is shown sans toupee for the first time on a film with a Village People-worthy Fu-Manchu mustache and sideburns any Hell’s Angel would envy. Travolta is the real engine behind The Taking of Pelham 123, and I can’t imagine what the film would have been without him. 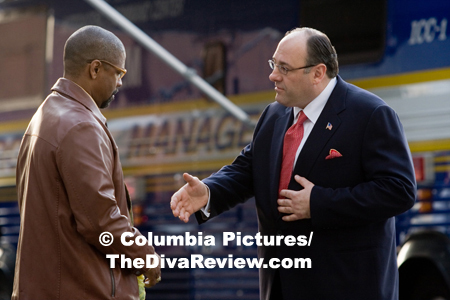 James Gandolfini is surprisingly effective as the egocentric mayor of New York City, who doesn’t appreciate criticism in his brief conversation with Ryder, or the challenge issued by the terrorist. 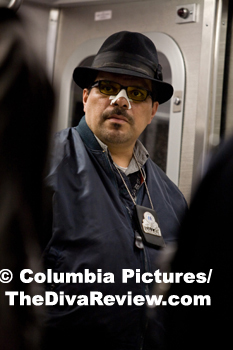 Those three performance (- as well as a Luis Guzman appearance!) 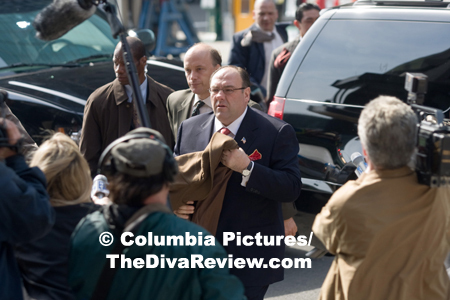 are the real reasons to see The Taking of Pelham 123. Gorier and dumber than the 1974 film, the plot (- written by LA Confidential screenwriter, Brian Helgeland) has got more holes than a golf course. There’s an unforgivably wasted opportunity for drama revolving around a commuter’s laptop, which amazingly can get an outside signal in the middle of the subway tunnel. This important device which should have been used to help the good guys get a bead on the hostage takers seems to have been put there only to provide the Tony Scott’s obligatory scene of some nubile hottie stripping (- albeit briefly, thankfully). For all Travolta’s brio, Ryder’s constant whingeing about all the evilness of New York and how wronged he’s been, the fact is pretty clear that the only reason for Ryder’s suffering is Ryder. Ryder’s kvetching and hair-trigger insanity makes him seem more like a spoilt crybaby upset that he actually had to do time for embezzling millions of dollars from his job than a criminal mastermind. Poor thing couldn’t get any more luv from fanny-models when he went to prison – at least not female ones. I much preferred the original film’s basic monetary motivation; the colour-coded thieves were after the dosh, plain and simple, no vendettas, no imagined enemies, just a well-executed heist. 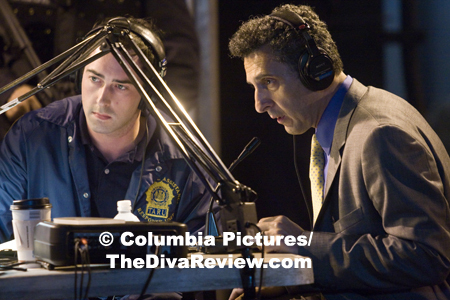 The film’s climax is full of goofiness that is once again lifted solely by the calibre of the actors. 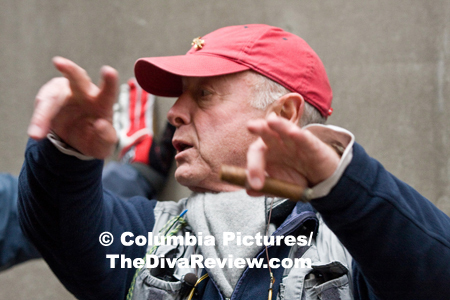 On the plus side is the amazing access Tony Scott had to the New York Subway system and all around the city streets. In this homogenised, sterilised era of Bloomberg, it’s almost comforting to see there are still rats in the subways; but I wish that Scott had been able to capture more of the caustic New York wit and personality of the 1974 piece. 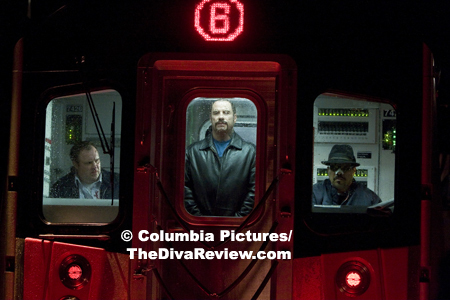 But for the name of the film, The Taking of Pelham 123 could’ve taken place anywhere there’s a train and a tunnel. There’s still the odd bit of unnecessary OTT violence thrown in just to make sure you’re awake, but The Taking of Pelham 123 is rather restrained by Tony Scott’s standards and the calmer tone suits this piece. Not your average bombs-away summer blockbuster, this update is still enjoyable if for nothing else, the muscular efforts of its great cast who seems perfectly aware of the long shadow of the original classic that looms before them.